← Cheese is still good. 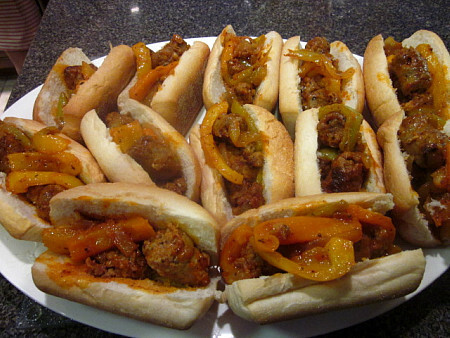 Google this: sausage & peppers recipe. How many different ones popped up? That’s the beauty of this dish – there are SO many different ways you can make it, and they’re all great. You can change it up year round, or use whatever method is your favorite, and it never disappoints. Pan, crockpot, grill, oven…which way do you usually make it? Below you’ll see how I usually do, although I’ve used several different methods. This is usually what’s easiest. Everything’s in one place, the ingredients are always on hand, and the end result is delicious. Cooking it on the stovetop is especially handy this time of year when you’ve run out of room on the grill, too. Don’t these remind you of the boardwalk, NJ peeps? Yum! In a pan, heat 2 tablespoons oil then add sausage. Cook until brown. In a large skillet over medium heat, add 3 tablespoons oil, then peppers, onion and garlic. Cook until slightly soft, then add tomato paste and mix it through the rest of the ingredients. Add basil, garlic powder, salt and pepper. 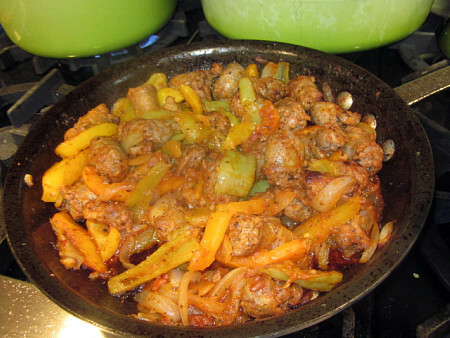 Transfer sausage to large skillet and mix until combined. Continue cooking until sausage is cooked through and the vegetables are soft. Serve alone, on rolls or with pasta. This entry was posted in freezer friendly, main dishes, make ahead, peppers, pork, sandwiches. Bookmark the permalink. Yum! This looks delicious. I think cooking it on the stovetop would be my preferred method, too. Oh my gosh, Melissa – this looks mouthwatering! I think I could get my husband to do just about anything for me if I made this for him! 😉 Thanks for sharing this wonderful recipe, and thanks also for stopping by my blog. Have a great day! I like hot sausage and your platter full looks divine! (The pasta alternative sounds great, too.) Keep cooking, Melissa!